A home. It is where people spend most of their family time. It is a place to gather friends. It is somewhere to escape the world in the comfort of someplace that is our own. And it is a location that is filled with a variety of big and small appliances and devices. The number of appliances, their size, shape, and their features change over and over again, and based on the advancement in technology, there are changes in the needs of consumers alongside a certain expectation of comfort and productivity. One of the properties of a device in a home is the location in which people place it. Where to place the device depends, among other things, on its use and the features that the device offers as well as its aesthetics. This study investigates the location of home networking devices, also known as routers, in modern houses. It also looks at how router features accommodate users based on the location where people keep the devices and how their needs have evolved. 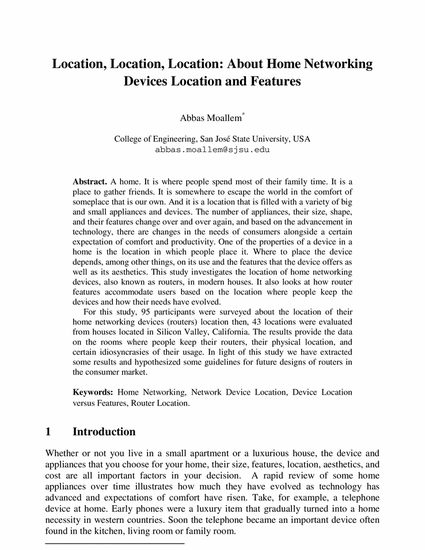 For this study, 95 participants were surveyed about the location of their home networking devices (routers) location then, 43 locations were evaluated from houses located in Silicon Valley, California. The results provide the data on the rooms where people keep their routers, their physical location, and certain idiosyncrasies of their usage. In light of this study we have extracted some results and hypothesized some guidelines for future designs of routers in the consumer market.